Today, activists across the country are celebrating immigrants and advocating for immigration reform. In honor of May Day, Susan Leslie and I have spent the past two weeks putting together a new printable 12 page resource for UU immigrant rights activists called Welcoming the Stranger: An Immigration Resource for Unitarian Universalists. The resource includes facts about immigration, related to UUA policy, a statement from UUA President Rev. William G. Sinkford, sermon excerpts, ideas and resources for taking action, and ways for youth to get involved. For the record, my favorite part is the sample of citizenship test questions on page 12. Just which are the two longest rivers in the U.S., anyway? And who was President during World War I? Unfortunately, I probably won’t be able to make it to the Immigrant Rights rally being held in DC this afternoon in Malcolm X park, but it makes me happy to know that immigrants and allies across the country are taking part in May Day mobilization activities. UUA President Rev. 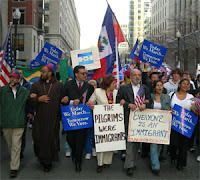 William G. Sinkford is speaking today at a May 1st Coalition Immigrant Rights Rally in Chelsea, MA, which became a sanctuary city in June, 2007. He will be speaking about why people of faith support immigrant families, and calling on Massachusetts citizens, organizations, and city and town governments to sign the Welcoming Massachusetts Pledge. If you attend a May Day immigrant rights event today, we would like your story! Please send a 1 or 2 paragraph report and a few digital photos to Susan Leslie, UUA Director for Congregational Advocacy and Witness, at sleslie@uua.org to have them posted on the UUA website. Where, What, When, Who. If possible, please highlight UU participation, and send digital photos that capture faith and families. We will include this with our report on UUA.org of May Day activities! Subscribe to our UU Immigration Activist News Bulletin. To sign up, check the “Immigration” box and submit your info. Susan and I send out about 1 email a month with information on federal immigration legislation, the New Sanctuary Movement, resources, and all things UU-immigration related. To conclude: Hurrah for Immigrants, Hurrah for Immigrant Rights Advocates of all backgrounds, and Hurrah for May Day! On March 13, a media firestorm began surrounding comments made by Reverend Jeremiah Wright, Jr., former pastor of Southside Chicago’s Trinity United Church of Christ. According to FOX News, “Sermon highlights [show] Wright . . . . portraying the country as institutionally racist.” FOX also called Wright’s comments, “anti-American invective.” Some news commentators went a step farther and condemned the entire Trinity United Church of Christ congregation as racist. By now, many of us are familiar with Wright’s words, which expressed frustration and anger towards the United States government for its role in deaths from HIV/AIDs, the injustices of the Drug War, and the systemic racism of the criminal justice system. These words have brought to the forefront the unique heritage and spiritual challenges that black Americans of faith carry to their places of worship and meditation. What does it mean to be living in a country whose government has authorized the enslavement, segregation and impoverishment of your race? As Reverend Al Sharpton said, and as UUA President Rev. Bill Sinkford has repeated, “People of color have a history, not a hallucination.” Reverend Wright’s words ministered to the real, legitimate, and righteous anger of congregants whose inherent worth and dignity have been discounted in North America on the basis of racial identity for over half a millennia. The hubbub over Rev. Wright’s expression of this anger has demonstrated that white and black people of faith are sometimes out of touch with one another. The words of Reverend Jeremiah Wright embody a powerful, prophetic convergence of race, class, politics, and faith that have inspired both feelings of joy and affirmation, and feelings of shock and discomfort. If we wish to grow in our relationships with one another, we must be willing to listen to things that may make us feel uncomfortable. Developing an anti-racist consciousness is a powerful experience, and as any anti-racist person of color or anti-racist white person could tell you, it is often neither easy nor comfortable. Listening to the pain of others, acknowledging your part in it, sharing your own pain, and asking others to acknowledge your truth is one of the most difficult processes for human beings to undertake together. It is also one of the most worthwhile. As an anti-racist ally who has lobbied against the crack vs. powder cocaine sentencing disparity, I am moved by Wright’s bold condemnation of injustice in the criminal justice system. As an advocate for economic equality who has volunteered in post-Katrina New Orleans, I experience a feeling of sorrowful affirmation upon hearing Wright’s critique that the United States government has at times treated its citizens of color as less than human. As a citizen of the United States, I feel pride that our faith leaders can publicly urge the government to greater accountability. The recent media storm around race is a challenge to people of faith to listen, to hear, and to get unstuck. Together, we are stronger than Burger King. This morning I was present at Capitol Hill Park for The Coalition of Immokalee Workers’s signing of the National Petition to End Sweatshops and Slavery in America’s Fields. So were Senators Sanders (VT) and Durbin (IL), Representatives Kucinich (OH) and Conyers (MI), Students United Against Sweatshops, the director of The Robert F. Kennedy Center, and many others. It was a truly inspiring morning. Speakers recounted the coming together of tomato pickers in Immokalee (rhymes with “broccoli”), Florida in 1993 to protest unjust working conditions and wages. When the growers who employed the workers wouldn’t listen, the Coalition of Immokalee Workers (or CIW) took their cause to the world’s largest fast-food corporation, Yum! Brands, which owns Long John Silver’s, A&W, KFC, Pizza Hut, and Taco Bell. In 2005, after an intense four-year boycott of Taco Bell, Yum! agreed to work with the CIW to improve pay and working conditions for Florida tomato pickers. As part of the 2005 agreement, Yum! resolved to pay a penny more per pound of tomatoes. According to CIW’s website, “Given that workers today receive roughly 1.3 cents per pound,” or about fifty dollars a day; $7,500 per year, “the raise amounts to an increase of roughly 75% for workers.” In April of 2007, CIW won a similar victory with McDonald’s. But not every fast food corporation is taking responsibility. Burger King has not only refused to pay workers a penny more per pound of tomatoes, but is actively working to undermine the CIW’s achievements. Senator Durbin declared, “The tomato on my hamburger is not worth the indignity that the workers of Immokalee must face every day.” And Rep. Kucinich stated, “The Civil Rights Movement is not over; it begins again today, and we need the help of American consumers.” Finally, Lucas Benitez, a farmworker and co-founder of CIW, spoke about the strength of consumers, workers, politicians, and companies standing in solidarity. “Juntos,” said Benitez, “somos más fuertes que Burger King.” Together, we are stronger than Burger King. As the ceremonies wound down, I spotted a woman wearing a clerical collar in the crowd and went up to introduce myself. The woman turned out to be Reverend Noelle Damico, who has led the Presbyterian Church USA’s Fair Food campaign. The Presbyterians have done some amazing work around this issue, and their website features a great Burger King Campaign FAQ. I left the petition signing inspired and disturbed–and if you’ve read this far, I hope that you’re feeling the same way. I am disturbed that Burger King, Wal-Mart, Subway, and Costco are contributing to the oppression of workers in the United States. But I am inspired that so many people are mobilizing around this issue. I hope that many Unitarian Universalists will support the CIW’s fight for justice. And finally, tell your friends! Heck, tell your acquaintances, and strangers, too. The farmworkers of Immokalee are counting on us. Now is the time to stand with CIW–and to prove that, together, we are stronger than Burger King. Holy Cow! Meatout is in Two Weeks! On March 20th, grassroots activists across the globe will celebrate the twenty-third international Meatout. Organized in 1985 by FARM, Meatout is a day for activists to promote a plant-based diet through leafleting, tabling, cooking, blogging, holding lectures, performances, walks, or concerts. Since becoming a vegan seven weeks ago, I’ve been pondering the connections between reduced meat consumption, vegetarianism, veganism, and Unitarian Universalism. Or, if you’ll allow the pun, you could say that I’ve been chewing on the seventh principle: We covenant to affirm and promote respect for the interdependent web of all existence of which we are a part. As the Meatout website says, there are many reasons to eliminate or reduce meat consumption. I decided to adopt a vegan diet because I did not want to be complicit in systems of animal cruelty, such as battery caging, which house 98% of America’s egg-laying hens, or the veal industry, which is supported by the dairy industry. Dropping my resistance to learning about the cruel treatment of cows and chickens, allowing myself to be changed by what I learned, and finally going vegan has fostered a radical awareness of my accountability in the web of existence. Other UUs follow the seventh principle in different ways. Take my co-workers in the Washington Office, for example: Adam buys local produce and commutes to our office by walking or biking. In his free time, he likes to hike and canoe. Alex uses a clothes horse to dry his laundry and subscribes to a local CSA . He and his seven housemates also practice reduced meat consumption. Grace carries reusable bags when she goes shopping, and plans to outfit her future children in cloth diapers, just like her mother, grandmother, and great-grandmother did. So while I wish in my animal-loving heart of hearts that everyone would stop eating meat, or at least practice reduced and conscientious meat consumption, I know that we all have different ways of honoring our relationship with the environment and all beings. But whether you’re a vegan, an ovo-lacto-vegetarian, a locavore, a freegan, or a lover of steak and eggs, I invite you to celebrate and learn more about the benefits of a plant-based diet on March 20! . . . . And to make it fair, on March 20th I’ll use a clothes horse and walk to work. Take a look at Meatout’s website for events, ways to get involved, resources on plant-based diets, and meat-free cooking advice. If your church is planning to do something for Meatout, you can register your event in the Meatout Event Directory. And for more information about Unitarian Universalism and animal welfare, check out UFETA, Unitarian Universalists for the Ethical Treatment of Animals. I wish you all a merry Meatout! Tenth Anniversary of United Students Against Sweatshops (USAS)! In 1996, the National Labor Committee published a report exposing the use of Honduran sweatshops by Kathie Lee Gifford’s clothing line, Kathie Lee, sold exclusively at Wal-Mart. The NLC’s exposé, along with similar concerns raised about Nike and Gap, brought sweatshops into the limelight. In response, concerned university students across the United States began organizing. Thus, United Students Against Sweatshops, or USAS, was born. Members of USAS began by targeting their own universities to ensure that the clothing their university sold was produced under fair labor standards. But students didn’t stop there—USAS was directly or largely responsible for multiple gains made in the anti-sweatshop movement in the years that followed. Among these was the October 1999 announcement of Nike and other companies that they would comply with the requirement to disclose their factory locations. This was the first time that any garment industry company conceded to this demand. In 2000, USAS members helped found the Workers Rights Consortium, an independent labor rights monitoring organization. In one year, over 80 universities joined the WRC, in spite of Nike’s “bullying” of WRC-supportive universities, such as NIKE CEO Phil Knight’s withdrawal of a $30 million donation to the University of Oregon. In 2001, the WRC and USAS achieved major strides for fair labor standards at the KukDong International factory (a Nike/Reebok production facility) in Atlixco de Puebla, Mexico, and the New Era factory in Derby, NY. Currently, over 170 universities and colleges are affiliated with the WRC. Today, USAS organizes its works into three major campaign areas: the Sweat-Free Campus Campaign, Ethical Contracting campaigns which includes a campaign against Coca-Cola, and Campus-Community Solidarity campaigns, which includes fighting for living wages for campus workers, and campus workers’ rights to organize. USAS demonstrates its solidarity with workers in sweatshops and on college campuses by supporting workers organizing themselves for better conditions. They pay special attention to the rights of women, as 90% of garment industry workers are women. USAS also runs not only regional member blogs, but also blogs for and by people of color, BGLT folk, people who identify as Womyn-Genderqueer, and working class people. In short, USAS is committed to working for justice in a just and inclusive way. If you want to read a more complete and truly inspiring account of the history of USAS, take a look at their page on the History and Formation of USAS. If you are affiliated with UNC–Chapel Hill, University of Michigan, UC-Irvine, UW-Madison, Middlebury, Duke, Georgetown, University of Oregon, or Occidental College, you might find this article particularly interesting. Visit USAS’s Take Action page and find out how you can become involved in the fight for workers’ rights. If you are a university freshman, sophomore, or junior, you can apply to be an international summer intern with USAS, which will send 8-10 students to different countries to research, organize, and build relationships with workers, unions, and other allied organizations. Happy Tenth Anniversary to USAS, and many happy returns! Read the rest of my post at http://www.streetprophets.com/story/2008/2/25/1017/29086, and check out the other great articles on Street Prophets! This year, Mardi Gras coincides with “Super Tuesday,” the day when the greatest number of states hold primary elections. This chance concurrence is a good opportunity to reflect on how the discussion about Gulf Coast rebuilding has unfolded in the presidental race so far–oh wait, that’s right: it hasn’t. Instead, Gulf Coast recovery has been conspicuously absent in campaign discussions and debates, in spite of the enormous need still present in the Gulf. For example, rent costs in the region have jumped 70%, less than 28% of the region’s former 82,000 rental units are on track to be rebuilt, and homelessness is escalating. Last week several groups, including the Katrina Information Network, worked to bump a question about Gulf Coast rebuilding up in an online vote which determined the questions asked at California’s presidential debates. In spite of pushing the question to the number 1 position for the Democratic debate and number 3 for the Republican event, not a single question about hurricane recovery was asked during the debates. Writers at the Times Picayune speculate that the voted-upon question was omitted because it was too “wonkish”—for those of you living outside DC, that means too policy-related and esoteric. Similarly, in President Bush’s State of the Union address last week, Gulf Coast rebuilding was glossed over with three sentences of rosy words. We owe it to those in the Gulf to make rebuilding a bigger topic during the remainder of the campaign season. Rather than deploring the Bush administration’s failures in handling the disaster, candidates should be acknowledging Congress’s continued failure to fix the situation, and out-lining the steps that they will take for Gulf Coast recovery during their presidency. Debate moderaters and journalists should be pushing candidates to explain their strategies to rebuild. Part of what we can do in the election season is educate the candidates about what issues are important to us and what issues we want them to be addressing. It’s up to us to be accountable to Gulf Coast communities and keep hammering away until this issue gets addressed. If a candidate visits your town, ask him or her a non-wonky question about their plans for how to rebuild the Gulf in a way that serves the needs of renters and low-income families. If you happen to know a journalist–or, better yet, to be a journalist–in the position of interviewing a canidate, ask them to question the candidate about rebuilding. If you take part in an online or telephone survey about what issues matter to you this campaign season, check the box for Gulf Coast recovery–and if there isn’t a box, write it in, or ask the survey-maker why it’s missing. Ask your friends if they’ve noticed the campaigns’ silence around rebuilding the Gulf Coast. It is up to us to show the candidates that we think Gulf Coast recovery is important; otherwise, it will continue to be a non-issue during the campaigns, lessening the likelihood that positive change will occur during the next administration. So let’s make a commitment to challenge our candidates and those who control the media to make rebuilding part of the conversation! Happy Mardi Gras, all. At the UUA Washington Office for Advocacy, we believe that the best way to celebrate Martin Luther King, Jr. Day is to continue to work for justice. The following blog post is offered in that spirit. On Friday afternoon, Kat and I, along with advocates from a dozen different faith groups, met for a forum on Native Americans and Federal Native Policy organized by the FCNL. There we learned about a few of the current grim realities that Native Americans are experiencing as a result of the flawed policies and mismanagement of the United States government. One injustice that we learned about concerns health–the infant mortality rate is 150% greater for Indians than it is for Caucasians. Indian life expectancy is six years less than that of the rest of the US population. And the suicide rate for Indians is two and a half times higher than the national average. Tomorrow, the reauthorization of a bill to improve Indian health will be voted on in the Senate. Reauthorizing the Indian Health Care Improvement Act of 2007 (S.1200), or IHCIA, would update and enhance the care that Indian Health Services and Tribal Organizations are able to provide. IHCIA would provide resources for the social service and mental health needs of the Indian community, as well as medical needs. IHCIA will be voted on tomorrow (Tuesday, Jan. 22) at 5:30 PM. Because we found out about this issue so late, our office did not send out an action alert; however, if you want to give your Senator’s office a call before the 5:30 vote tomorrow (the sooner the better! ), then check out the National Indian Health Board’s IHCIA Fact Sheet and Action Alert for talking points. A woman from the National Congress of American Indians told us that Native Americans are a very dis-empowered community in regards to their voice on national issues. “We had a much stronger voice in the 1970s, and the difference was you guys,” she said, scanning the room. “It was the national church organizations.” The voices of people of faith speaking to their representatives in Congress can lend strength and support to Native American organizations that are seeking justice. In the future, I’ll try to stay attuned to federal legislation related to Native American justice issues, so that our office can give you plenty of notice for the next Action Alert. In the meantime, check out the National Congress of American Indians for ways to get involved!